It seems strange to think that the winters here in Israel can be cold, sometimes even freezing. We are so used to reading (and writing!) about the hot summer sun, camels, deserts and sand. And how one cannot survive the excruciating heat without drinking gallons of water or eating buckets of ice cream. Israelis CAN and do basically eat ice cream throughout the winter months but there is a special warm, very local, very Middle-Eastern pudding called sahlab that should definitely be tasted. Sahlab is a sweet milky custardy pudding with a very distinctive taste. Apparently in the olden days milk was warmed and thickened with sahlab powder, made by grinding the tubers of special orchid. These days I am pretty positive that it is thickened by adding cornstarch and maybe a lick of commercial sahlab powder. One can even make it at home, for an easy recipe, check out this site: Sahlab recipe. I once tried a cocunut milk version that did not turn out very successful but I think it was because I was not generous enough with the sugar. But if you find yourself in Israel, in the winter, do yourself a favour and give it a try at the nearest sahlab stand. You are sure to come them across in the markets, beach fronts and other tourist hangouts. My daughter and I had the cup of sahlab in the photo in an upmarket coffee shop in Dalayit el Carmel, a Druze village in the northern part of Israel. There was no wrinkled old person standing on the street and stirring the huge sahlab pot while shouting out to everybody to try a cup. 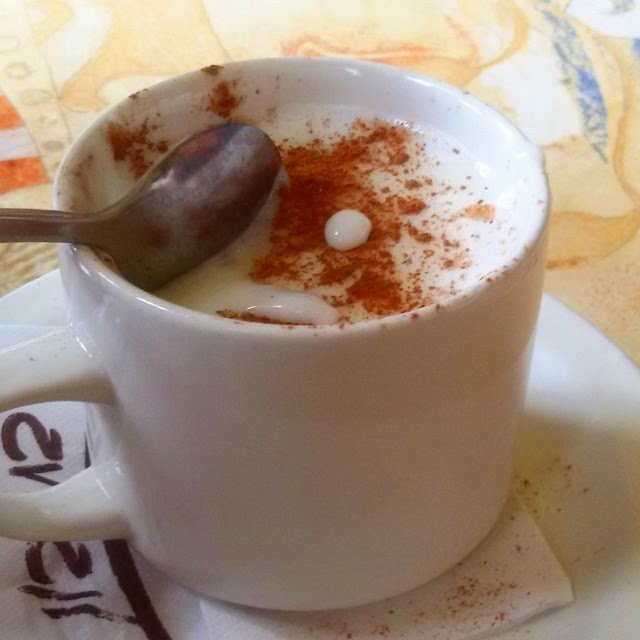 Instead, after ordering it from the menu, a young Druze girl made it for us from the steaming milk of the cappucino machine. It was warm, thick, spicy and with a distinctively Middle-Eastern taste. The methods may have changed but the warm sahlab tradition is still very much alive and tasty in the Holy land!